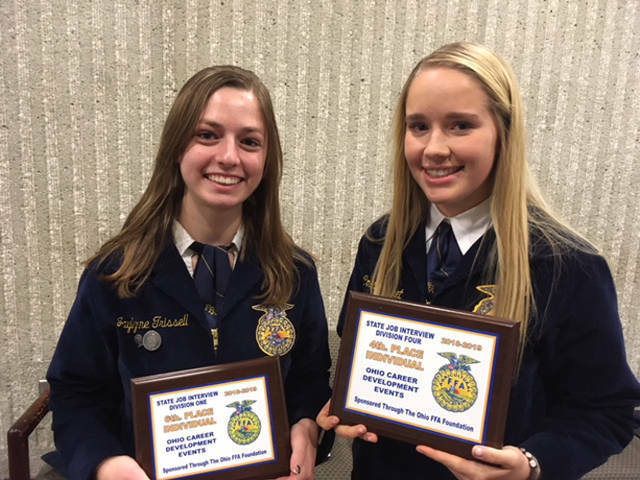 Versailles FFA members who competed in the State Job Interview Contest included Jaylynne Trisse (left) and Colleen Gehret (right). COLUMBUS – Members of the Versailles FFA competed in the State Job Interview Contest, which was held on Dec. 1 at The Ohio State University. The contest is designed to assist FFA members in the development of oral and written skills that are associated with the job application and interview process. Students had to create a resume and cover letter, fill out a job application pertaining to a specific agricultural job, complete an interview and compose a follow-up thank you letter. The members who competed in the state contest included Colleen Gehret and Jaylynne Trissel. Individually, Gehret placed fourth in the state in the senior division, and Trissel placed sixth in the state in the freshman division. Gehret and Trissel advanced to the state after placing first in District 5 in each of their grade division. Gehret and Trissel thanked Amy Hoying, Roger McEldowney and Aaron Moran of Versailles Schools for assisting with preparing us for the job interview contest.